I am super excited to share the new PomPoms pattern with you! 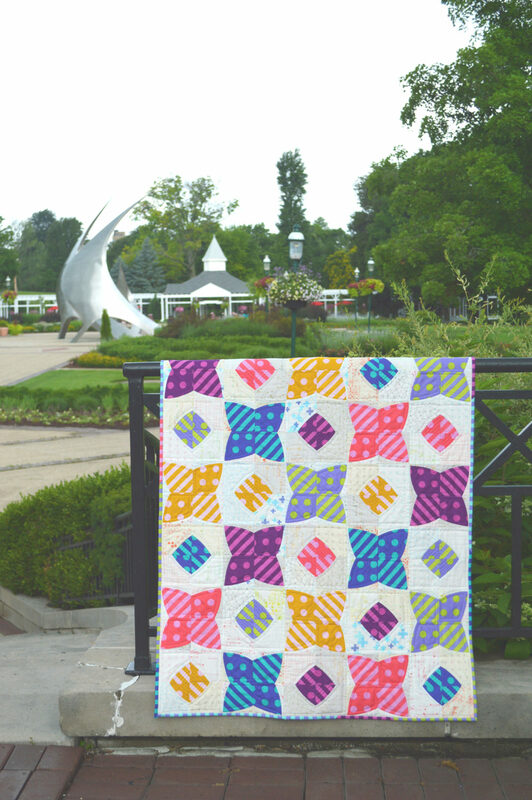 This quilt is going to a fun one for mixing your favorite fabrics and I can’t wait to see what you all come up with. 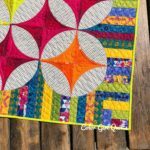 Of course, the sample quilt with polka dots and stripes in coordinating colors is about as happy as you can get in the form of a quilt, but lots of other combos will work too. Believe it or not, this design is an easy sew and goes together very quickly. The latest design for the Classic Curves Ruler is sure to be one for your colorful collection. I made the original sample with a selection of Tula Pink dots and stripes and a bunch of light prints from the Zen Chic collection “modern backgrounds”. To be honest, when I got about half way through with this, I wasn’t happy that I had used the light prints for a scrappy look rather than a solid white. Once it was all done, I totally love it! Do you ever do that? second guess yourself and then end up loving your first idea? But of course, now I want to make another one with different prints and a solid background to try out a new look. 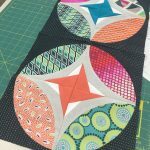 The dots and stripes bundle in half yards available here on the website is enough to make the throw size quilt, 63″ x 70″. The same bundle in fat quarters will make the baby quilt, 35″ x 42″. You can also get the fabric in yardage, Here. Pattern includes three size options and an illustration that you can use to plan your color placement and adjust to make your own size and shape as desired. 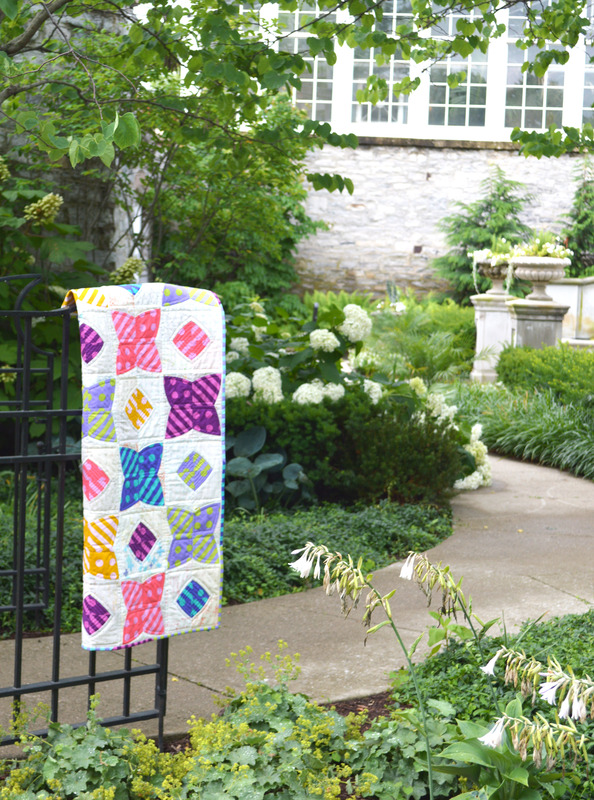 It’s fat quarter and scrap friendly so you can showcase some favorite fabrics, new or old. The cutting is super quick and easy with the Classic Curves Ruler and pieces are accurate and easy to sew together for a beautiful finish. I used Hobbs batting in mine and pieced with Aurifil thread. Quilting is with clear monofilament so it blends with both the colors and the light fabric. That’s my go-to favorite for easy quilting. 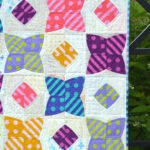 If you use fat quarters, after cutting the shapes for the blocks, use the leftovers for a cute scrappy binding! Be sure and share what you make with the PomPom pattern, I’d love to see! use #classiccurvesruler and #colorgirlquilts on IG and Facebook.